You’ve got one Hall-of-Famer at first, one would-be Hall-of-Famer at third, a catcher with better numbers than many of the catchers in the Hall of Fame, a gold-glove-winning all-star at shortstop, and three excellent, underrated run-producing machines (Singleton, Smith, White). Some would likely argue that Bump Wills is the most obscure member of this team, but to me he always stood out, mainly because of his name, but also because he was the son of a renowned major leaguer, had a notoriously odd baseball card, and was, during my most impressionable years, considered to have the potential to be an up-and-coming star. 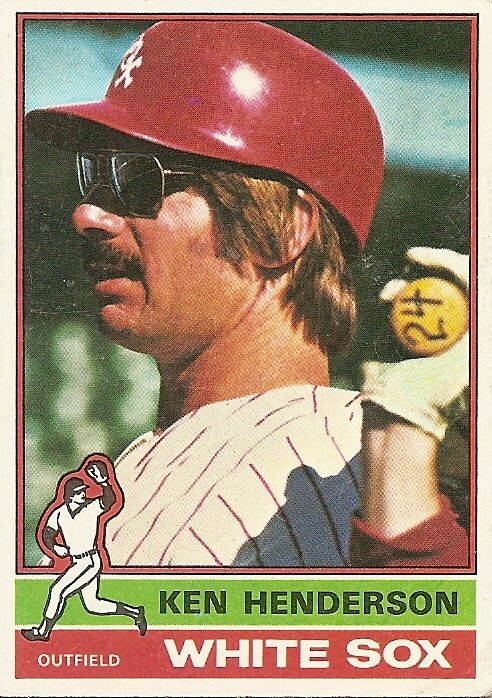 And he actually wasn’t bad for a few seasons in the late seventies, which happened to be the same time Ken Henderson, my choice as the least known of the all-1970s switch-hitting team, was bouncing from team to team, making little impact anywhere. The card here shows him just beyond the turning point in his career, when he went from a good young player with an admirably well-rounded game to an aging cigarette-ad fugitive gaping out at the action with a bat dangling limply from his fingers. He wears the first of six uniforms he would don over the next six years, never lasting beyond a season anywhere. He was the most itinerant of the members of the 1970s switch-hitting all-stars, and so in a way he’s the most fitting representative of that decade of often senseless transience. And since talking about the 1970s without talking about the preceding decade would be like talking about a morning hangover without mentioning the party the night before, it should be mentioned that Ken Henderson in some ways epitomized the 1960s, too. In that earlier epoch he had been brimming with seemingly limitless possibilities, breaking into the major leagues with the Giants in 1965 as a 19-year-old would-be successor to Willie Mays. With that in mind, here’s another list in which Ken Henderson’s name again seems to be the most obscure. In the 1970s, as it became clear that no new utopias were going to spring to life out of sheer visionary ecstasy, and for that matter that no one would ever replace Willie Mays, everyone seemed to suddenly start growing older in bursts. Skin that had long been unblemished suddenly became slacker, creased, faintly greasy. Mustaches were grown, Marlboros lit, aviator shades donned. Throughout the land it became increasingly difficult to tell what people were thinking, in part because of the tinted eyewear, in part because the thinking itself, once so sure of itself, had unraveled into the uncertainty of a switch-hitter who has lost the ability to hit from either side of the plate. 1. Ken Henderson was white? Never occurred to me. 2. 1 : A surprise to me, too. 3. If you grew up on the West Coast in the 1970s, Ken Henderson’s ethnic makeup would not come as a surprise. 4. 3 : Yeah, I’m sure that’s true. Growing up in New England I didn’t experience any similar confusion about the Red Sox’ Reggie Cleveland. 5. I think a West Coast fan might have seen more players because you’d see the East Coast teams on the Game of the Week and then all the other West Coast teams on local broadcasts. Having to stay up past bedtime wasn’t an issue all that much. 6. I would expect to see this guy at the am/pm filling up a 64 oz. soda pop and buying some smokes. Marlboro Reds. To me, this is what all guys named Ken should look like. I grew up around a few of them. 7. You forgot Larry Herndon on that list of young SF Giants outfielders in the 1970’s. 8. 7 : I thought about Herndon, but on closer inspection of his stats I discovered that he actually came up with the Cardinals before coming to the Giants. I’m pretty sure the guys on this list all came up through the Giants’ system. Love it. Great piece Josh. Go Blue Jays … err … Rangers! 10. That is an awesome photo. 11. Henderson was one of Ted Turner’s first acquisitions upon buying the Braves in 1976. It would be hard to find a team with more comings and goings than the ’76 Braves. It was a profoundly weird but exciting time to be a young Braves fan. For some reason, I remember Ken Henderson as a reluctant member of the team, but I get a sense from the picture that maybe he just wasn’t particularly forthcoming. I don’t know. 12. 6 I never knew I was a member of such a stereotyped group. 13. Ken Henderson was supposed to have been the 1978 Mets’ big acquisition, teaming with Steve Henderson in the “Henderson Brothers” outfield. Only Ken crashed into a fence the first week of the season and didn’t play for the rest of the year. Kinda like Moises Alou for this year’s Mets team, a completely worthless weapon. 14. 13 : I think of Steve Henderson as the first of the three Hendersons (Rickey and Dave being the others) who retroactively clouded the misperception of Ken Henderson described in 1 and 2 . Gerald Henderson of the Celtics also contributed. 15. 14 : Florence Henderson, of course, was a counterweight to that for many years. Ken Singleton is very underrated. As a matter of fact, I think several of the guys on this list are underrated (Reggie Smith, Ted Simmons, Roy White and Singleton). Numbers nerds like us (or most of us here) like those guys, I wonder if that’s a coincidence? I also never realized Bowa was a switch hitter (nor did I realize he was Nick Johnson’s uncle.) Cardboard Gods illuminates as well as entertains! Boy, if there ever was a card that typified 70’s baseball this is one of them. Moustache, Shoulder Length Hair, Tinted Prescription Aviator Glasses, White batting glove, “RED” White Sox helmet. Switch-hitting was the big thing in the 70’s into the early 80’s it seemed like every kid was encouraged to switch hit back then. I used to go back and forth left/right with my Johnny Bench Batter Up. In Retrospect, I think baseball was a little too overzealous trying to make everyone switch hit. It seemed like the Royals wasted much of U.L. Washington’s career trying to make him a switch-hitter. I remember the Phillies spending 2 years trying to make Bob Dernier a switch hitter which never panned out. I think by the mid 80’s teams realized it was better to keep a player batting right handed or left handed and just try to improve his hitting. Actually, he’s a dead ringer for Chuck Norris from about that same era. Or possibly the “Todd” character from Mike Judge’s “Beavis & Butthead”.